The 2017 Chevrolet Cruze Hatch! “ The Cruze has been a very popular car for us, our best selling small car. The Hatch version will give us a new audience to go to,” said Pat Spina,Sales Manager of Badanai Motors Thunder Bay. The Cruze is very efficient on gas at 5.9 liters per 100kilometers. GM is coming out shortly with a diesel engine for theCruze. The 2017 Cruze Hatch can include Apple Carplay, Android Auto, 4G LTE WI-FI and Chevrolet Mylink. It offers space to spare and has the DNA made up of adventure. 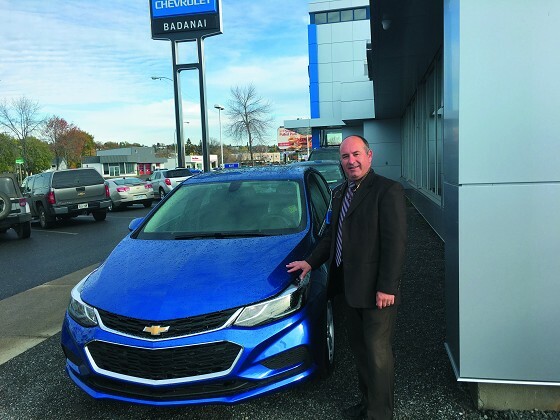 “ The car business has been very good this year with lots of sales, 0% financing and GM is offering attractive incentives to the consumer.” said Pat. You can see the the 2017 Chevrolet Cruze Hatch at Badanai Motorsin Thunder Bay!